Me: "That's a melon Eli, you're right though, it is shaped like a ball." Me: "That also looks like a ball bud, but that's an orange." Me: "Still not a ball, that's a tomato." We finally escape the produce, bringing our oh so fun game of "Produce Ball" to an end. Until of course we round the corner and come to the meat, where there also happens to be a huge display of watermelons. And the game continued. When Eli was born, he was a white version of his daddy. As he gets older, people say he looks more and more like me, but he is his daddy's boy through and through so it's really no surprise that his favorite word is "ball". Sports are in the kid's blood. 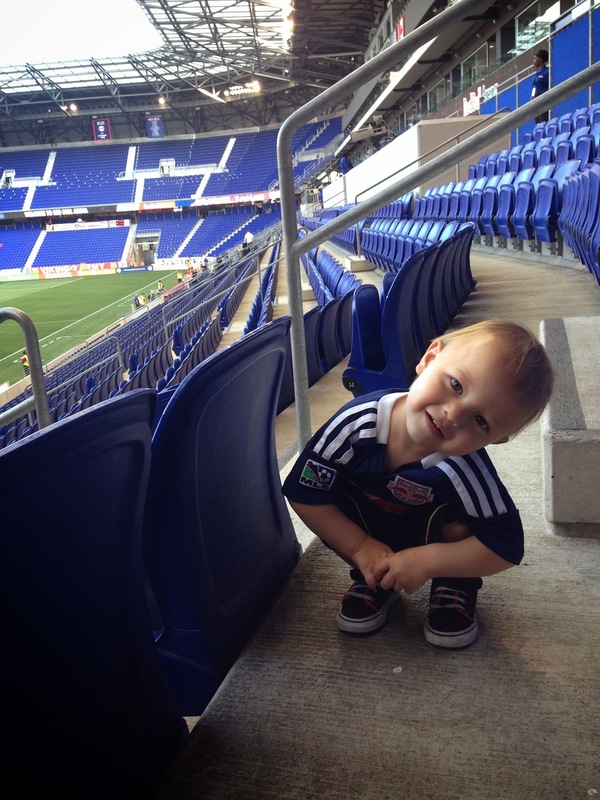 He attended his first game when he was just one-week-old. It's pretty amazing how much he absorbs just by watching the game being played so often. I mean, look at this form??? The last home game was the first time he really recognized Luis on the field. He'd point to the goal and say "Dada". And wouldn't you know, just a few days later at the playground, he did this. He insisted that he stand between the posts and that the ball go there as well. He is imitating his Dad more and more each day, in so many different ways. From the soccer field to the putting green. If Luis could choose a sport for Eli to play, it would be golf. While he copies a lot of what Luis does, there is one thing he did recently that melted my heart more than anything else. He sat and "read" Luis's Bible and spoke enthusiastically as he flipped through the pages. He was so animated with hand gestures and all. As much as I love that he is already showing a love for sports, I pray more than anything that he loves Jesus and loves reading the Word. There are a lot of attributes that I hope he gets from Luis--determination, persistence, patience, intelligence, athleticism--but most of all, I pray he gets his unwavering faith and his desire for the Lord. I can't top teaching our son to read the Bible, but there is one thing he is picking up from me that I am quite proud of. He looooves being in the kitchen when I cook. He has since he was 8 or 9 months old. 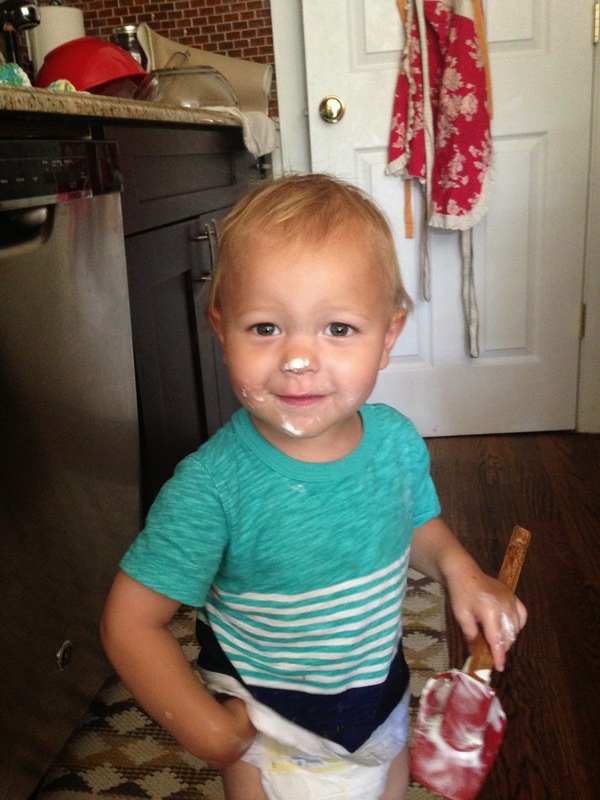 His first word was "hot" because he was in the kitchen so much with me and I would often say "hot" when he would point to the stove or oven. And now he is finally interested in helping rather than just being held which makes this mama's heart (and arms!) so happy. He has helped put blueberries on a fruit pizza (and helped me give up my need for perfection when the pattern was off) and helped me fill the enchiladas the other night with cheese and chicken. 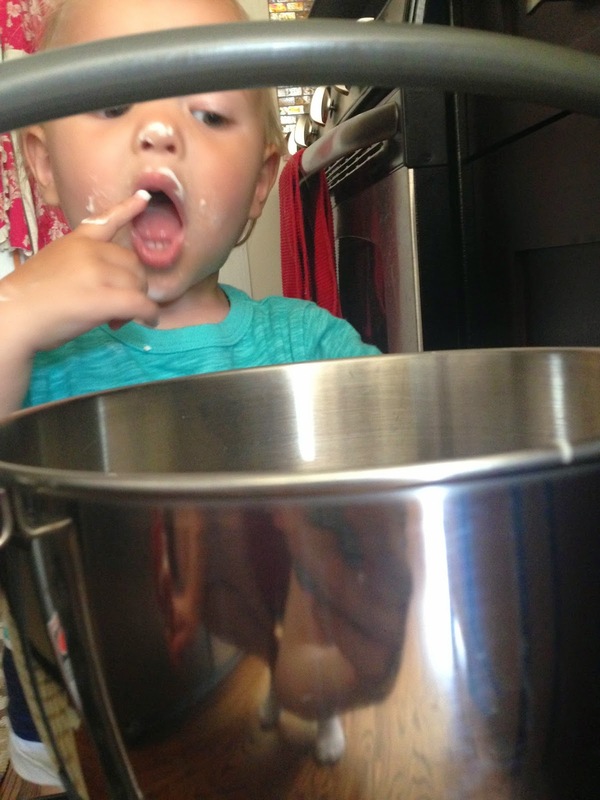 He has learned the art of licking the bowl. And the spatula of course. He also insists that we wear aprons now. A boy who loves Jesus, plays sports AND can cook?? Watch out ladies, we got a heartbreaker in the making. So precious! What a little cutie. And that story about the Bible, it just melted my heart.